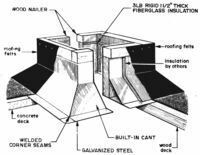 Custom fabricated to fit all manufacturers' skylights, power roof exhausters, intake and relief vents, smoke hatches, flues, or job fabricated items . Provides uniform curb construction, method, and quality, with watertight design. Simple to detail, convenient for contractors, minimum architectural field supervision, low known cost. 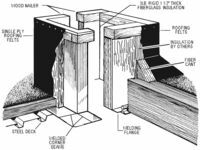 The sure way of attaching roof felts. Eliminating felts from slipping, sagging or buckling. Helps eliminate vibration hum. Internal 3 lb. density rigid fiberglass board, built-in where it can't be omitted. Provides condensation-free openings and aids in sound absorption. 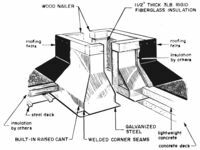 Continuous welded corners creates rigid monolithic construction and is designed to meet project weight requirements. Provides maximum strength with minimum expansion and contraction.